After my last post I decided that I’m going to build a large format camera and also hopefully cook up some plates to put inside it. With that in mind I thought it would be best to try building a small scale prototype. Mechanically this prototype will probably be drastically different from the final design but no doubt some of the ideas will make it through to the end. Also once the prototype is finished I’ll then make another more refined small scale version. I’ll call this the EH1 and the large format version the EH2. This morning I went out and bough myself a pack of four mini canvas and a hack saw. I figured that the canvas frames would be perfect for the building the camera, focus screen and film magazine/dark slide. I removed the canvas and hacked one of the frames up to build two smaller frames for running along the guide rail (the guide rail was a long piece of metal from inside a door handle.). These were then attached to the larger frames. Initially I used super glue but they were’t very secure so I added some tape as well. To be honest I rushed the building of the guide frames and these bits are a bit ugly and aren’t very exact but they get the job done. Besides it’s a prototype. Not going for perfection – just something functional and so far they seem to be working just fine. I haven’t figured how to make dark slide yet but I have (sort of) built a focusing screen using some plastic recovered from inside an old projector T.V. and it works a treat. Can focus from around 30cm to infinity. with a longer guide rail I could bring that closest focusing distance down further. 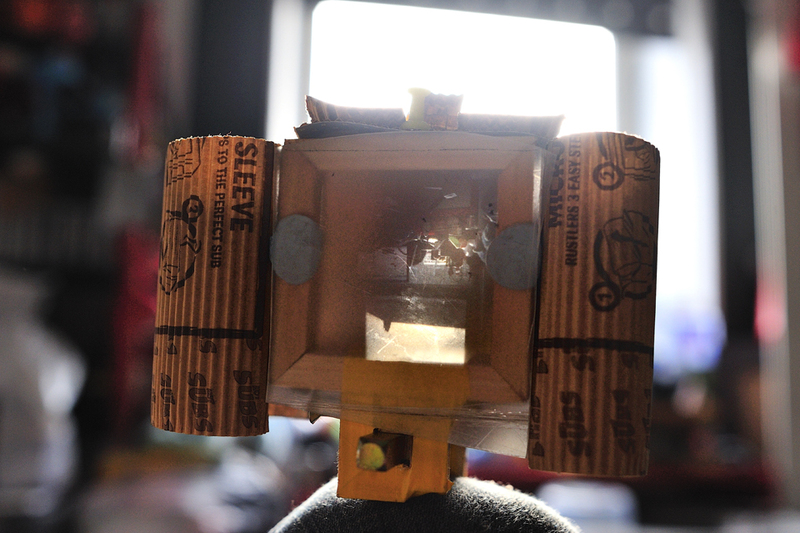 At the moment I haven’t made the bellows to connect the front and the rear frames so I’ve been using weird some ribbed cardboard to cut down the light. So that’s it for now. Still have a fair bit of work to do – namely bellows and a dark slide (or in other words the hard bits) Will post when they are done and then I’ll begin work on a more refined and proper version.